Looking forward from 2012 to 2060 the Hispanic population will grow dramatically in numbers and as a part of the total U.S. population. The Hispanic population was only 17% of the total U.S. population in 2012 but will make up 31% of the total U.S. population by 2060. See the chart below. From 2000-2006 we saw a dynamic population increase for Hispanics in virtually every state. Only New York had less than a 20% increase in its Hispanic population. 15 states had increases of more than 40% in those 6 years. The Hispanic community has begun to seek out new locations to live and work in recent years. 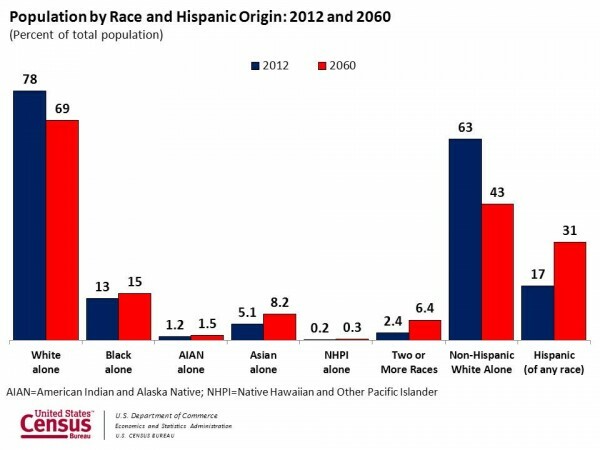 This suggests that the Hispanic community is now found or soon will be found almost everywhere in significant numbers; as seen in the chart below.